This go kart has an age range from 3 years +, offering years of fun and excercise to come. A double rear wheel braking system. Product Dimensions: 94L x 64W x 56H cm. This toy costs approximately £59.99 (for the latest and best prices make sure you check our retailer list for the Purple Racing Team Go Kart above). 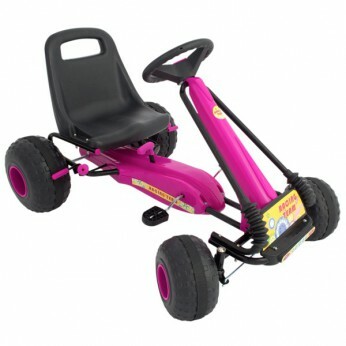 In our review of Purple Racing Team Go Kart we classed it as being suitable for ages 3 years, 4 years, 5 years but recommend you check the manufacturer specific advice before purchasing.